Harrisburg, PA – Governor Tom Wolf today called on state House of Representatives leaders to pass funding for state-related universities. These bills, so-called non-preferred appropriations, were approved by the Senate in July. They have yet to be called up for a vote by the House. These appropriations include funding for the University of Pittsburgh, Pennsylvania State University, Temple University, and Lincoln University. 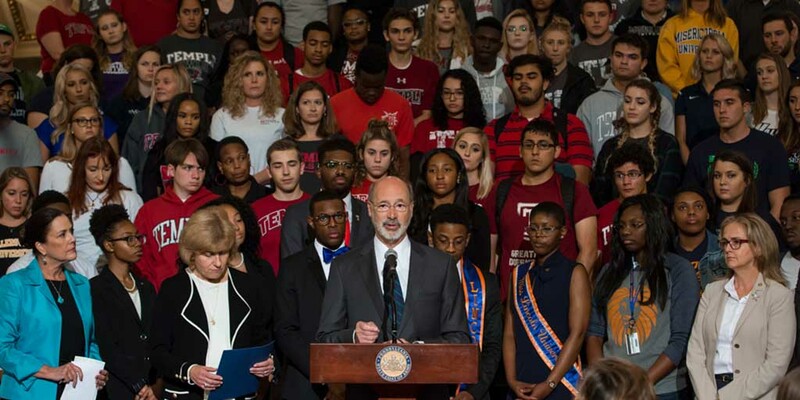 “It is long-overdue for the House to approve this essential funding and no longer hold our students and universities hostage,” Governor Wolf said. “There is no more time for excuses, and if the House fails to act as they have for months, these institutions of higher learning will be forced to increase tuition. After years of drastic cuts by the previous administration, we have increased funding for higher education in the commonwealth. We cannot go backwards. Last week, Governor Wolf spoke personally with the leaders of Penn State, Pitt, Temple and Lincoln to reassure them of his commitment to maintaining their funding and ensuring students do not face higher costs as a result of these bills languishing in the House of Representatives.